Chosen for their bravery and loyalty, Night Guardians uphold an oath to help children develop their inner courage and overcome their fear of the dark. 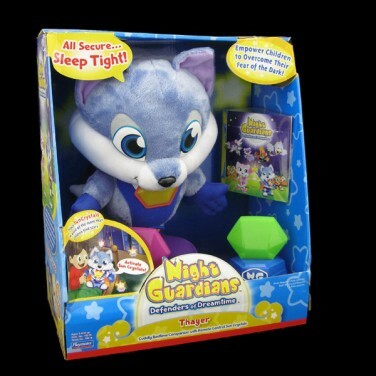 Night Guardians Thayer and Skye are two cuddly bedtime companions designed to help children to overcome their fear of the dark. Each Brave Guardian plush comes with three Sun Crystals that can be placed around the room in areas that children find scary. Read them the included bedtime story 'Night Guardians - Defenders of Dreamtime' which tells of the adventure and courage of the Night Guardians. 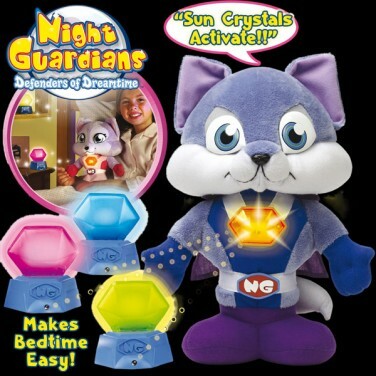 When it's time for the lights to go our, Your child can comfort themselves by simply squeesing The night Guardian's paw and all the Sun Crystals will illuminate. Night Guardians can provide a degree of real safety by plaing the Sun Crystals in dark hallways or bathrooms, they can help your child see around the house at night. The Night guardian teddy will illuminate all the sun crystals when its paw is squeezed and reassure your child with a recorded message 'All Secure... Sleep Tight! '.